We’d love your help. Let us know what’s wrong with this preview of Falling by Tara Benham. To ask other readers questions about Falling, please sign up. Let me start by saying that it's rare I give 5 stars to anything paranormal. This was nothing short of a 5 star read. The story of an angel Bayla learning to allow human feelings, trusting her mission, and sacrificing for the grace of others is inspiring! I am going to venture to say that if this book got enough promoting it could truly be a best selling series. I know I am on the edge waiting for book 2 in September. Fans of Amy Bartols premonition series would love this!! Thank you for allowing m Let me start by saying that it's rare I give 5 stars to anything paranormal. This was nothing short of a 5 star read. The story of an angel Bayla learning to allow human feelings, trusting her mission, and sacrificing for the grace of others is inspiring! Not quite what I expected but much more. I love paranormal stories but tend to cringe at most people adaptions of angels and demons. They all seem to run together and stay eerily similar. This one however was a refreshing and engaging change. It’s not a romance novel to me but a young adult paranormal read. I would recommend this story to anyone in High School and college as well as beyond. They are young twenty somethings with a mixture of Angel’s and Demons. I’m definitely loving the angel and demon paranormal department. It’s fascinating to read each author’s difference on how they make and view these worlds. Tara Benham wrote a powerful coming of age novel in my opinion. It had a lot of deep thought-provoking moments. So much so, It’s not a romance novel to me but a young adult paranormal read. I would recommend this story to anyone in High School and college as well as beyond. They are young twenty somethings with a mixture of Angel’s and Demons. I’m definitely loving the angel and demon paranormal department. It’s fascinating to read each author’s difference on how they make and view these worlds. Tara Benham wrote a powerful coming of age novel in my opinion. It had a lot of deep thought-provoking moments. So much so, that I didn’t want it to end, nor put it down once I was done. I will say this is a content for now ending. There are two more in the series and as soon as I get over the next few stories I am reading I plan to go back and get these two. Seriously if you are just looking for good paranormal then grab this book. I can picture myself letting my son read this as he gets to high school. Definitely makes you think on a higher level, good or bad, and the choices you make. Bayla is normally the angel to insure events take their natural course. She is sent on a mission that is different from anything she’s done in the past. She also has been given help on this mission. Not fully understanding all the help and players in the game, she does some unconventional things. I love how Tara describing Bayla’s thought process when tasked with a mission. The descriptiveness of her as an angel set a tone that drew you in like Hannah wanting to touch the ethereal wings. Hadraniel is the blue sent to protect Bayla and ensure she completes her mission. He is a wise character that intrigues Bayla and garners her respect. They develop a sibling bond that I don’t think will ever be broken. Declan is a wild card. I’m trying to figure him out and even in the end I’m left with more questions than answers. He crashes into Bayla’s world and throws it off kilter. Not stopping to explain he realizes what he had too late in the game. Even heavenly love doesn’t have the strength required. Hannah was a lovable young adult. She had this quality about her that everyone wanted to be her friend. She was compassionate and honest. When she needed to step up, her resolve steeled her to do what she didn’t think she could. Father Paul is like a true father to Bayla, guiding her and supporting her. I feel like reading the next two in the series we might get more about his hand in all this. My gut tells me he knows so much, but that could just be me speculating. I have so many questions and I don’t want to spoil. But do we ever find the reason behind the time change? Do we find out about Gray? Do we learn Bayla’s truth? You can find this review and more like it on blog: Declarations of a Fangirl. Holy crap on a cracker, Batman. I was not expecting this book to get to me the way it did. It started off alright. Easy, smooth read. The world building was solid and when Bayla and Hadraniel get to the town in Kentucky, everyone was just so nice. I had trouble relating to Bayla at first. She was just so bland and took everything at face value...which of course makes sense because she has had very little human interactio You can find this review and more like it on blog: Declarations of a Fangirl. I had trouble relating to Bayla at first. She was just so bland and took everything at face value...which of course makes sense because she has had very little human interaction, so she doesn't understand catch phrases or emotions. Once it dawned on me that she was just like Castiel, then she became a darling to me. Hadraniel was just this big, muscly teddy bear. He about gave me a heart attack at one point. Thank goodness I have the full trilogy. Can't leave a girl hanging like that! What a great read! I love reading about Angels and demons! I really enjoyed all the characters, save for 3 of them lol! Bayla is really reserved, but also sweet and caring. Life as a soul collector hasn't been an exciting one. She totally cut herself off from humanity and relationships of any kind because why have them in her line if work. They will only die. watching the forging of new friendships was amazing and I was happy bayla was still capable. Bayla has never failed a mission, but this new What a great read! I love reading about Angels and demons! This book has me excited to read the next. If you like YA, paranormal, or both you should check this one out! I was pleasantly surprised that the characters were not typical of what you'd find in a book about teens. There was a little teen drama but it all had a purpose and all fit with the characters and their stories. Can't wait to "fall" into the rest of this series and unravel the mysteries behind Bayla, Declan, and Hadraniel. All I can say is WOW! Now this is quite the read, unexpected, but what I would call an amazing read. I wasn't sure at first because the whole angels and demons theme but this one certainly changed my mind. Just when you think you know what is going to happen, BAM....another twist. I would really recommend this one to anyone and it's a series I will be carrying on reading in the future. 5 stars from me! great read, great storyline. I really enjoyed this book and highly recommend it. Bayla is an awesome character and I could relate to a lot of her feelings, torments, and actions. The characters are well developed. Storyline is solid. Great twists and I want to see how book two plays out. This was an unexpected story at every turn. Just when you think you know what is going to happen the story takes a twist. The whole series is a must read. I haven’t read a novel with Angels and Demons in a while so when I received this copy for review, I was delighted. I wasn’t disappointed either! It’s a YA adventure/romance and very clean. I would recommend it for the 13 years and up crowd. The story is a bit slow in the beginning but when things pick up in the middle be ready for nonstop action! Also be aware of unanswered questions as this is a series in progress, you’ll have to wait til Book 2. I loved how Bayla’s character evolves from a no I haven’t read a novel with Angels and Demons in a while so when I received this copy for review, I was delighted. I wasn’t disappointed either! It’s a YA adventure/romance and very clean. I would recommend it for the 13 years and up crowd. The story is a bit slow in the beginning but when things pick up in the middle be ready for nonstop action! Also be aware of unanswered questions as this is a series in progress, you’ll have to wait til Book 2. I loved how Bayla’s character evolves from a no nonsense workaholic Angel, to a full spectrum “person” with feelings. From the first time she makes a friend to the first time she plays Truth or Dare, it’s a delight to witness. I’m giving Falling a 5 out of 5 stars. It’s a great way to spend a rainy afternoon. 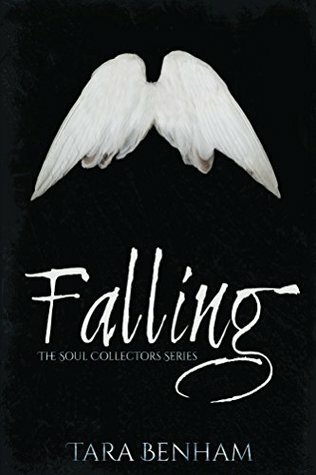 I was beyond ecstatic when I won Tara's signed copy of Falling. This was a great win, and one that I won't soon forget. It did take me awhile to finish, but by the end, I must say that I'm glad it took me as long as it did, and that book number two is only a couple short days away! This was easy but very entertaining book to read. I want to read more about Declan and Grey. And I can not wait to read what happens to Bayla. We all have read books about Good vs Evil, but let me tell you something about this particular book/series. Not only is a book that will have you read it and understand it easily but you will want to start on book two as soon as you finish this one. Bayla the Heaven's Soul collector, Gray Ellison the teenage human, and Declan the Demon get involved in this story not only will they have you biting your nails but you will not know what or whom to choose in this battle. I don't know about you but if We all have read books about Good vs Evil, but let me tell you something about this particular book/series. Not only is a book that will have you read it and understand it easily but you will want to start on book two as soon as you finish this one. I don't know about you but if this science fiction genre is your thing then you will not want to miss this book/series because believe me you don't want to wait another day without reading it. An angel's story from a different viewpoint. Good.